Describes how to test CFL code, try out the results of functions, test layout coding, etc. quickly and easily by using Cyrious's debugger or to diagnose what part of a how-to_make_coding_easier_with_the_formula_builder code sequence is not producing the results you want or expect. 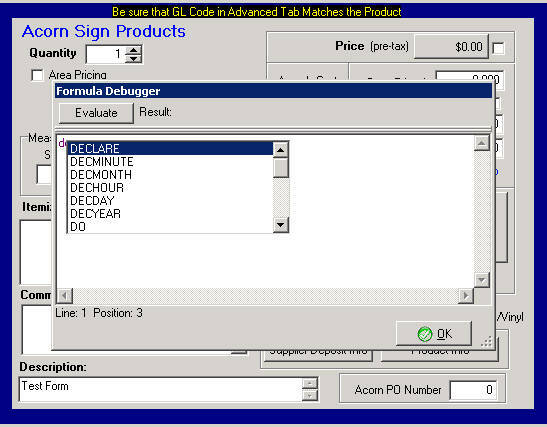 When using the CFL debugger to test code, you will need to have an Estimate or Work Order open in Edit mode and the product for which the code is written the selected Item. 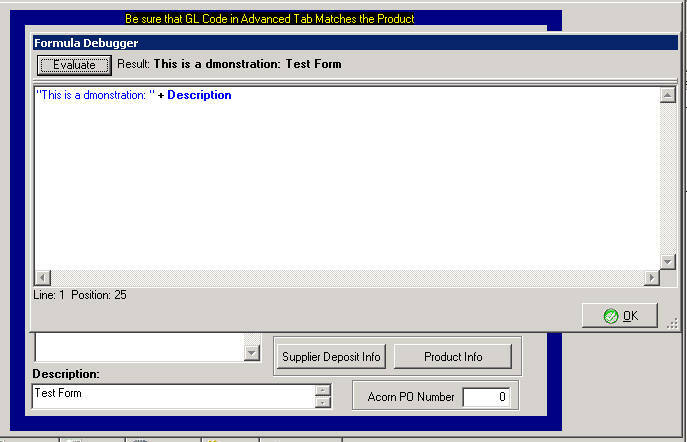 Oen an Estimate or Work Order and Select/Hightlight the line item for which the code you wish to test is designed. On your keyboard click Control/ALT/SPACEBAR. This will bring up a window where you may enter CFL code. When you click on Evaluate, you will see the results of the code. Note the result of the code is shown on the "RESULT" line at the top. It corresponds to the value in the Pricing Form behind it. For Help on finding Code and Variables you can click again on CTL/SPACEBAR and you will get a dropdown list of most of the Variables, Functions, etc. available in CFL. This tool tries to guess what you are looking for and fill it in for you, but you can just scroll through the whole list to look for something you think might work for what you are trying to do. Caution Using the “Helper”: The CTL-SPACEBAR function has some fragility to it. You can exit this window by Pressing ESC. However, if you use the backspace to delete letters or certain other key combinations, you may initiate a variety of error messages suggesting the code in your Pricing Form is flawed and ultimately be forced to “Force Quit” and restart Cyrious. certain sections of code from your formula to test what other parts are doing.